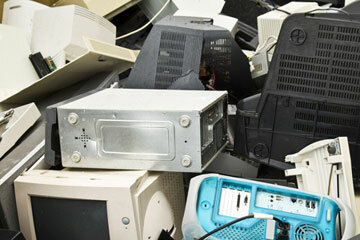 Geneva/Nairobi, 15 August 2012 - The European Union (EU) has adopted new rules on electrical and electronic waste (e-waste), which aim to allow EU member states to combat the illegal export of waste more effectively. The new directive, which also seeks to improve e-waste recycling levels, drew upon research from a number of sources, including Basel Convention research and data. Recent studies by the Basel Convention on e-waste in Africa have highlighted the ongoing stream of used electrical and electronic equipment reaching the continent from industrialized countries, including the EU member states, for recycling or disposal. The Basel Convention is administered by the United Nations Environment Programme (UNEP). Electrical and electronic equipment can contain heavy metals such as mercury and lead, as well brominated flame retardants, which can damage human health and the environment. Hazardous substances are released during various e-waste dismantling and disposal operations, posing serious health risks to workers. The new EU directive aims to improve collection schemes in member states, where consumers can return used electronic and electrical items free of charge, thereby increasing the recycling and re-use of products and materials. The directive introduces a collection target of 45 percent of electronic equipment sold that will apply from 2016 and, as a second step from 2019, a target of 65 percent of equipment sold, or 85 percent of electronic waste generated. From 2018, the directive will be extended from its current restricted scope, to all categories of electronic waste, subject to an impact assessment beforehand. The new directive will also oblige exporters to test whether equipment works or not, and provide documents on the nature of shipments that could be thought illegal. The new rules entered into force on 13 August 2012. In preparing its proposal for the new directive, the European Commission examined research conducted by the Basel Convention Co-ordinating Centre for the African Region, based in Nigeria. The EU also consulted two Basel Convention Country Fact Sheets on e-waste in Nigeria and Ghana. Studies in Ghana carried out under the Basel Convention’s e-waste Africa programme, which has received financial assistance from the EU as well as other donors, revealed that in 2009 around 70 percent of all imports were used electrical and electronic equipment. Around 30 percent of the used equipment was determined to be non-functioning, and hence should have been defined as e-waste. According to a recent Basel Convention study, the United Kingdom is the dominant exporting country to West Africa of electronic and electrical equipment, followed by France and Germany. For more information, visit the Convention’s programmes of activities for the environmentally sound management of e-waste in Africa in Asia Pacific and in South America.